Anyone that has savored a USDA Prime Graded Steak knows that it is delightfully tender and juicy with a buttery flavor which makes it distinctively superior to any other steak. Only 2% of beef produced in the US is certified as USDA Prime. You will not find Patio Daddy-O USDA Prime in the supermarkets since its limited supply is gobbled up by affluent consumers. The Tomahawk Steak is a long-bone Rib Steak. The long bone makes it stand out from any other steak and it guaranteed to make an impression. A well-marbled Rib Eye at its center and delicious Rib Eye Cap that wraps around one side of the steak. 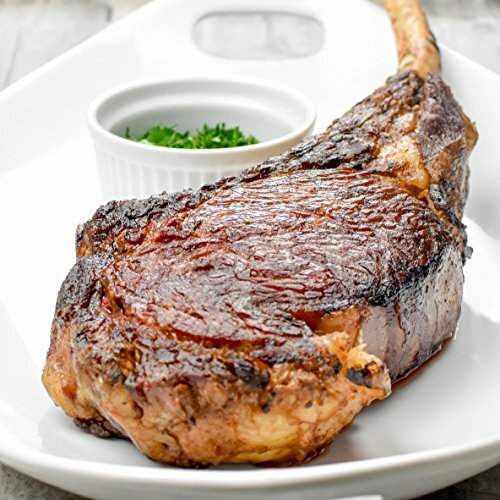 36 Ounce Tomahawk Chop is a super thick, center cut ribeye steak with the entire rib bone with Our Signature Finishing Box The perfect steak choice to for the steak lover which can be shared or an individual serving. Includes The Patio Daddy-0 Finishing Box. Each Box contains our Signature Steak Butter, Rub, and 4 Steak Thermometers. Each New York Strip is individually vacuum sealed Free Shipping Sweet Awakening Patio Daddy-O Rub & Butter Labels A balance of sweet and spicy with earth tones. Steak Rub 3.5oz: Pacific sea salt, coffee, chili powder, pioppino mushroom, garlic, onion, spices Finishing Butter 4oz: Butter, dates, honey, pioppino mushroom, salt Rubs and Butters are made in a facility which processes wheat, milk, eggs, nuts, soy, fish, peanuts and other common allergens. The perfect steak choice to for the steak lover which can be shared or an individual serving. If you have any questions about this product by The Patio Daddy-0, contact us by completing and submitting the form below. If you are looking for a specif part number, please include it with your message.